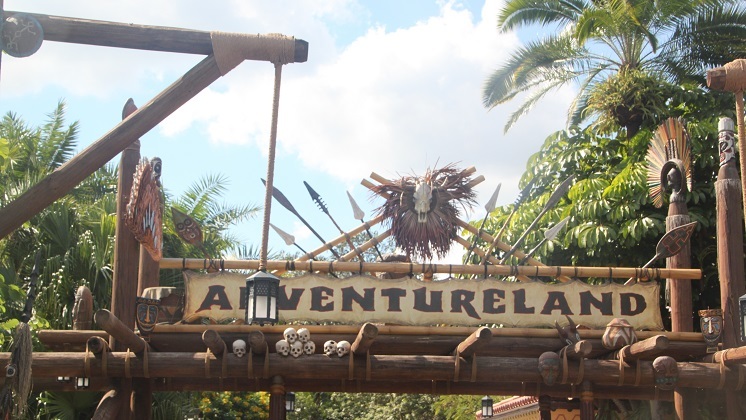 Disney’s take on adventure is all jungles, pirates, treehouses and magic carpets. Definitely a bit of a retro take on it all but I just loved the lush vegetation and that Tiki theme. You are supposed to feel transported to the remote jungles of Africa, Asia and the South Pacific. It did not feel remote though or far from civilization to us – actually the opposite. The walkways here are narrow and really congested, it is so easy to overlook the authentic landscaping as you have to keep avoiding people. A shame really as the palm trees and bougainvillea are so lovely. 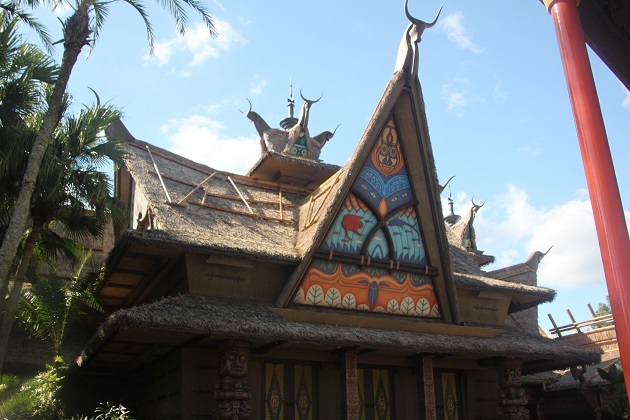 We started here with The Enchanted Tiki Room. 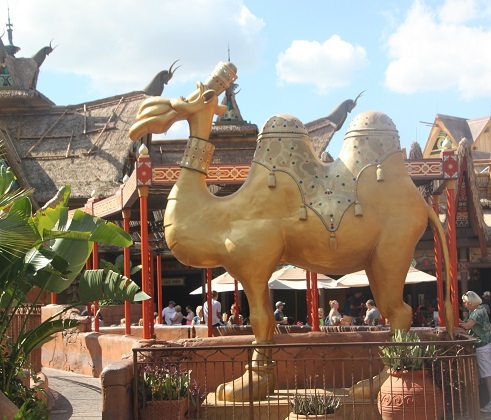 This is one of those original Disney attractions, maybe to some outdated but they are my favourites. A little show in a quaint setting involving a company of animatronic birds, orchids and totem poles, they have been performing and singing Sherman Brothers music since 1963. Apparently this was handpicked by Walt himself, I found it captivating and the perfect way to escape the heat and cool down – a tropical storm is even thrown in for good measure. 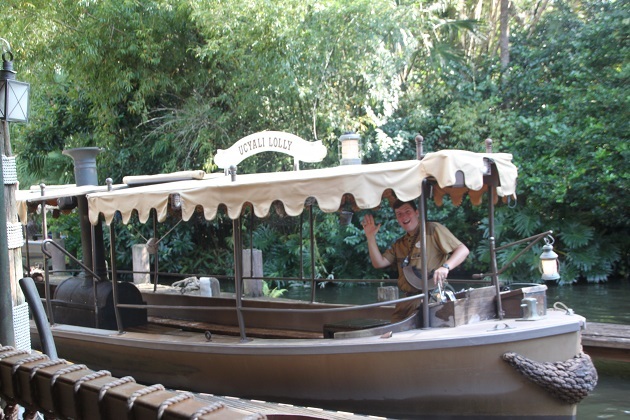 Son’s favourite attraction here was Jungle Cruise. A bit of a corny tour on a boat through the “rivers of the world” with a guide telling cheesy jokes – every guide tells the same jokes. We know. We rode this three times and Son still found it hilarious – I beg to differ on that one. After being “spat on” by the camels near Aladdin’s Carpet, we climbed onto the carpets and got some great views from up top – when Son wasn’t making our carpet ascend and descend at rapid rates that is. 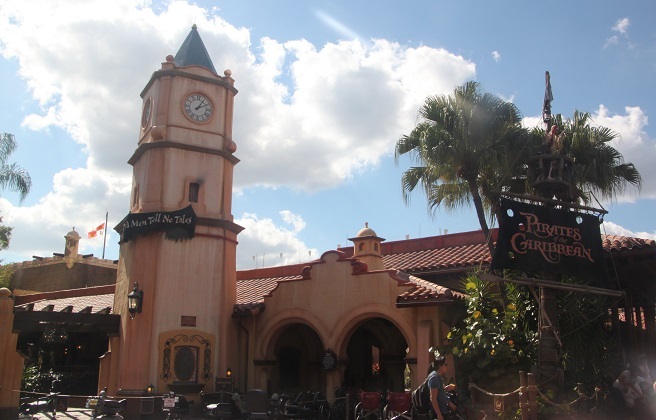 Pirates of the Caribbean is one of the most popular rides in this area. It starts off really well, the line takes you into a cool, dark, underground cavern which twists and turns down to the boat ride. Lots of pirates everywhere, the pirate ship is amazing and the attention to detail is superb but we thought the animatronics were maybe just a teeny bit dated. Last for us was the Swiss Family Robinson treehouse. A climb up 116 steps, we explored the family’s living quarters. No wood but fun to explore and some nice views of the Magic Kingdom from right at the top. After all that adventure it was time to leave for us – my only regret not getting a Dole Whip. We’ll have to go back…. YO HO YO HO It’s a Pirate’s life for me! Cheesy, humid at one point, but still one of my favorite rides at Disneyland. Oddly enough today #1 Grandson and I were singing this song today! You’ll probably need the last line to get it out of your head now. SORRY! I haven’t climbed that tree of the Robinson’s since I was a girl! My son loved it. I haven’t done or seen the magic carpet ride. I wonder if that’s a Disney world ride only? I’ll look! My son and I just sang the Pirate song the whole way to school!! Like you say, can’t get it out of my head now!! 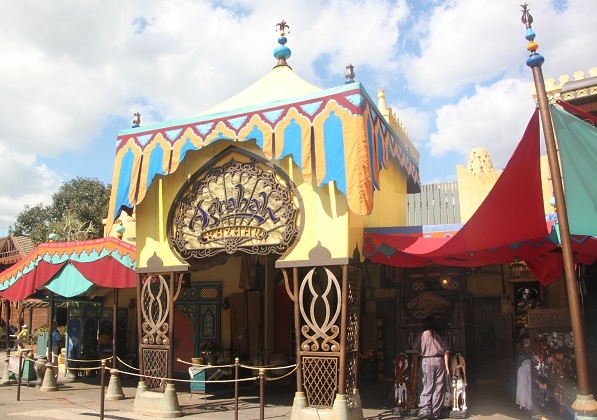 Not sure about the magic carpet but it’s fun – a bit like the Dumbo ride only different theming. I used to dream of living in the Swiss Family Robinson’s tree house. Many decades later, I think I’d still really like that! 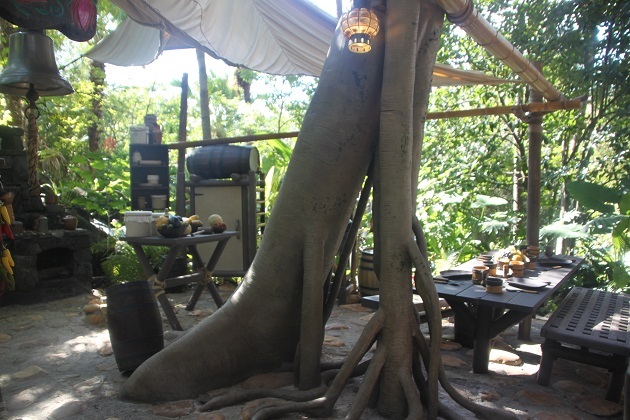 There was someplace in England that had a fantastic treehouse/restaurant. Was it Alnwick Castle? Brilliant idea. Yes it’s Alnwick Castle and it’s amazing – we spent an afternoon there and loved it. Treehouses never lose their appeal! So glad to hear that someone else loves the Tiki Birds! I find it is one of the best spots in the Magic Kingdom for a break from the heat, and the show is just adorable. Some of my family like to nap through it though! I completely agree but think my husband may have sneaked a quick and crafty nap!! I love the Enchanted Tiki Birds, too. We haven’t seen Aladdin’s Carpet; I wonder if that’s new? I think your assessment is spot on. Someone else mentioned Aladdin’s Carpet wasn’t in Disneyland so maybe it’s just here? Those tiki birds are just fantastic!! My oldest son described the Swiss Family Robinson tree house as being like the queues for some other rides but with no cool ride at the end. I personally quite enjoyed the break from the crowds and the noise and the views were definitely worthwhile but I could see why my kids – after the razzmatazz of some other rides – thought it was lacking. They loved the Magic Carpet ride though. They went on that loads of times. I too thought the Pirates ride was a bit tired and needed rejuvenation. It didn’t even feel as good as the version we had seen at Disney in 2008 but maybe that is because that was my first time. I remember being blown away by the Pirates ride years ago, like you say though maybe because that was our first time!! I totally get what your son thought of the treehouse too – very true, although I did like it for the very same reasons as you! I love Pirate of the Caribbeans, the atmosphere is so great ! It is a great ride. I have the pirate song running through my head just thinking about it!! It is so much fun – hope you make it there someday! Looks like you had a fun time Joy though am sure you might not have gone on the Jungle Cruise 3 times if you hadn’t had your son with you! Still it looks like a wonderful place especially for kids. The Swiss Family Robinson treehouse looks like it provided a bit of a tranquil respite from the crowds. The whole place must be enormous by the sounds of it and so many different themed parks – makes Euro Disney look tiny in comparison! It’s so long since we visited Euro Disney Rosemary and we were only there for 2 days when our son was very young so I don’t have too much of a recollection but I do think it is a lot bigger here. You definitely need to pace yourself! !